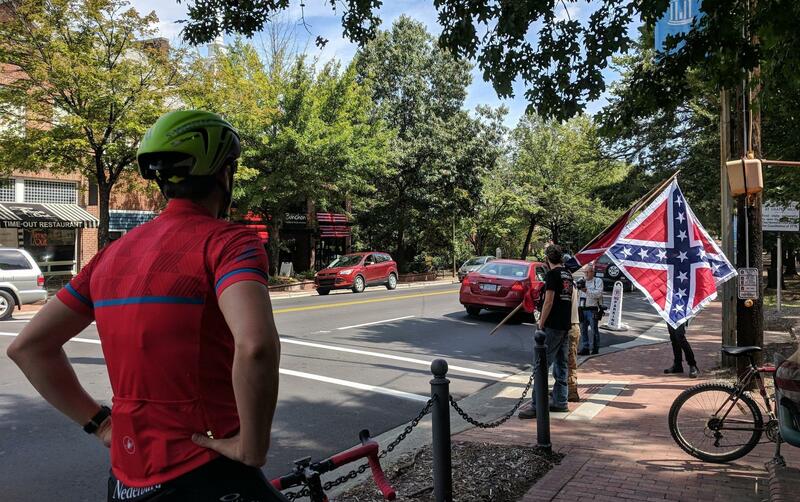 A cyclist looks on as pro-Silent Sam protesters with a Confederate flag leave the scene in Chapel Hill. Barry Brown, John Quick, and Danielle Shochet were charged with assault. Alexander Joustra and Lillian Laura Price were charged with damage to property. Kristin Emory was charged with resisting arrest and Thomas Bruefach was charged with inciting a public disturbance. Events began Saturday morning, when several individuals stood near the Silent Sam site, carrying Confederate flags and signs. A nearby protestor pointed out that “Mike” also had an SS tattoo on his neck, which he said was "from his past," and he had not removed it. He and other protesters argued and debated non-violently for about an hour during a calm among the crowd after police made several arrests earlier in the morning. 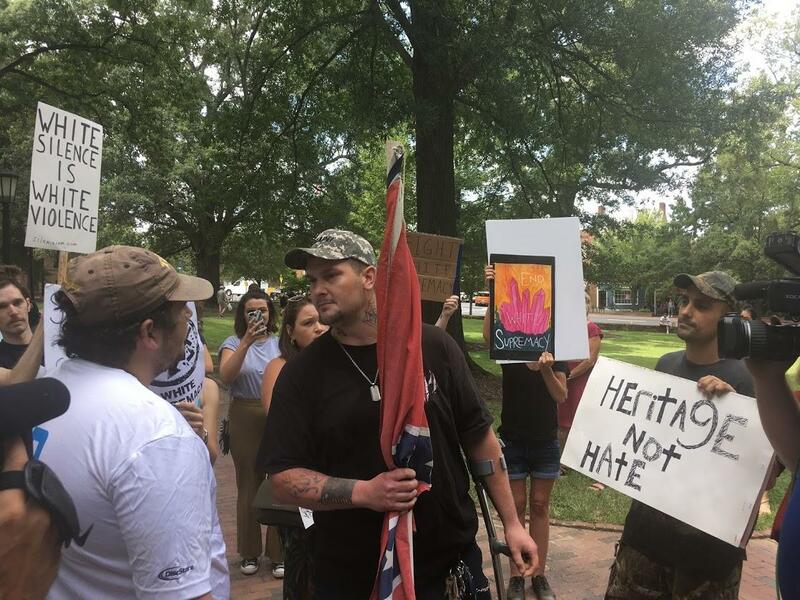 Man who identified himself to WUNC only as Mike carries a Confederate flag and engages with counter-protesters at the UNC-Chapel Hill near the base of the missing Silent Sam Confederate statue. On Friday, UNC officials sent a campus-wide notice saying they were aware of social media posts that indicated protests might be planned. On Monday night, a group within a crowd of 200-300 protestors pulled Silent Sam off its pedestal with ropes. The statue had stood in McCorkle Place on campus since 1913. UNC police have issued arrest warrants for three people: Jonathan Fitzgerald Fuller, 27; Lauren Aucoin, 23; and Raul Arce, 27. UNC Board of Governor members, including Thom Goolsby, say a 2015 law passed by the General Assembly dictates that Silent Sam be returned to its pedestal within 90 days. UNC administrators have not announced what they intend to do with Silent Sam. In a conference call on Saturday after the protest, UNC Chancellor Carol Folt gave her opinion what should be done with the statue. "In the interest of public safety, I would find a better location, a safe, secure location for the monument," she said. "If I could do that, that is what I still believe is necessary."